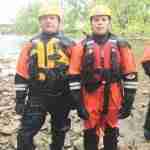 The men and women of West Lake would like to introduce the two newest members of the Water Rescue Team. Lieutenant Dennis Albrewczynski and Firefighter Alex Scantlebury completed the WRER course this past weekend. With the addition of these members, our water rescue team is now comprised of 25 highly trained personnel ready to take action in any type of water emergency.